Toys R US also recently announced a comeback, though under a sub-brand name. Their stores have been closed since June, and there have been previous gallant proclamations of a restart, but none have come to fruition. Reviving a brand that is mostly or completely dead is not an easy proposition. There are very few examples of restarts that rise to their previous levels of success, which is not to say that it’s impossible to turn at least a small profit on a redux brand. Just very difficult for a variety of reasons. In the case of both the Bon-Ton and Toys R Us, the substantially altered retail world led by the king of disrupters, Amazon, is a tidal wave of change that largely swept them both aside. 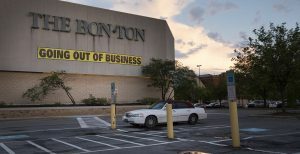 Department stores like Bon-Ton die a death of a thousand cuts as specialty e-tailers chip away at them with low prices, free shipping, and broad selection. As a category leader, Toys R Us didn’t adapt its own online presence fast enough to compete with another 800-pound gorilla, Walmart, which took away substantial sales volume. The new owner’s concept for Bon-Ton is to add it to its broad array of online brands it already markets and milk the remaining equity that way. They are also promising to begin reopening brick-and-mortar stores, but that is step 2 in the plan and likely depends on step 1 succeeding first. The investors in Toys R Us also have a two-step plan that calls for stowing the lead brand in the attic and opening a wholesale business under the name Geoffrey’s Toy Box, which uses their sub-brand mascot name. This is an interesting naming strategy that raises at least a few questions. One, why would a B2B audience—toy buyers for retail—care about a sub-brand originally aimed at children? And two, is it really setting up the new brand to go back into the retail market at some point? Step 2 of the Toys R Us plan calls for re-launching the original brand and the Babies R Us brand as well in a brick-and-mortar kind of way. Featured image courtesy of The Wall Street Journal.